The motion of space-based observatories is a delicate balance between gravity and angular momentum. To control and measure telescope orientation and to point from target to target, space observatories used gyroscopes. Gyroscopes are essentially spinning disks whose orientations in space are maintained due to the physical principle of the conservation of angular momentum. This is the same physical principle that allows a bike rider to control their orientation and direction in space. By controlling the rate of spin of a particular gyroscope, telescope controllers can change the pointing direction of a space telescope. Gyros are thus essential to the operation of modern space observatories. As with any mechanical system, problems can arise. X-ray astronomers were worried to hear that, on October 10, the Chandra X-ray Observatory, NASA's flagship X-ray observatory, experienced a glitch in one of its four onboard gyros. This glitch meant that, for an interval of a few seconds, the orientation of the observatory and its rate of motion were not well determined. Chandra has protective systems in place, which, if such an anomaly occurs, puts the spacecraft in safe mode, until ground controllers can figure out what happened and restore normal operations. During safe mode, the spacecraft automatically swaps critical telescope hardware to back-up units, and the spacecraft points so that the solar panels get maximum sunlight and its mirrors point away from the Sun to avoid inadvertent damage. 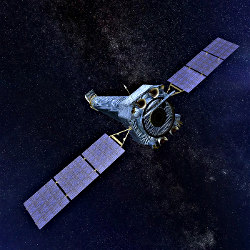 Fortunately for the high-energy astronomy community, Chandra was recovered from safe mode within only two days, and a fix was implemented over the next few days. Chandra resumed normal science operations on October 24.